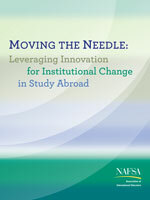 Moving the Needle: Leveraging Innovation for Institutional Change in Study Abroad examines the impact of three specific study abroad grant programs— the 100,000 Strong in the Americas Innovation Fund, the US-China Student Exchange Leaders, and the Partnership for Innovation and Collaboration on Study Abroad—on the higher education institutions that applied for and received funding. The report found that even the relatively small, one-time grants awarded through these programs can help encourage an institution to make a more long-term, sustainable investment in study abroad. The programs included in this study were modeled after the recommendations of NAFSA’s 2003 Strategic Task Force on Education Abroad and the subsequent Commission on the Abraham Lincoln Study Abroad Fellowship Program. The task force determined that in order to increase study abroad it would be necessary to incentivize colleges and universities to remove the barriers that prevent their students from studying abroad. The Lincoln Commission advocated for a new national study abroad program that would primarily target higher education institutions, rather than individual students. For over a decade, NAFSA has advocated for the development of such a national study abroad program through passage of the Senator Paul Simon Study Abroad Act. NAFSA has also worked closely with the Obama Administration and private sector partners to facilitate the grant programs included in this study and pilot the type of grant envisioned by the Simon Act. This report shows that these grants can be an effective and efficient way to increase the number and diversity of students studying abroad by incentivizing higher education institutions to prioritize study abroad.